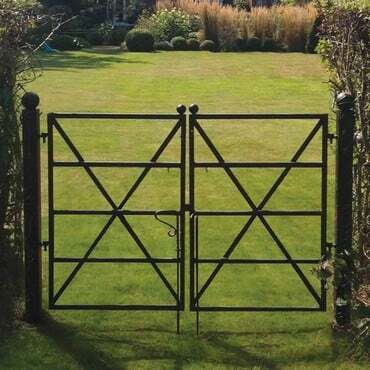 Bespoke half size Roman Arch with X Brace Gate design, exclusively manufactured by Harrod Horticultural. 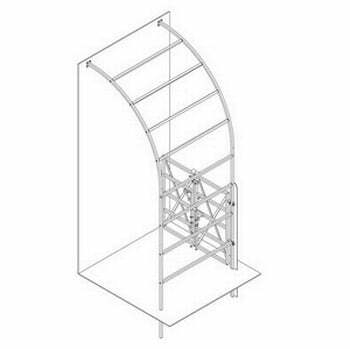 The Roman garden arch is our most popular design of metal garden arch and it is easy to see why, with its clean, simple lines this strong steel metal garden arch creates a stunning focal point around the X brace gate. Bespoke half size Roman Arch with X Brace Gate design, exclusively manufactured by Harrod Horticultural. The Roman garden arch is our most popular design of metal garden arch and it is easy to see why, with its clean, simple lines this strong steel metal garden arch creates a stunning focal point around the X brace gate. 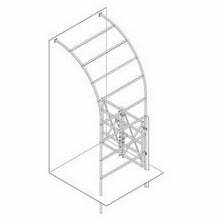 This design uses half a Roman Arch, secured to the wall with superior fixings. The X brace gate secures to the half arch structure with hinges so the gate can open outwards, providing extra space inside the framework. Our Roman Garden Arches combine our own manufacturing excellence with a design which is definitely 'tried and tested' resulting in metal garden arches incredible in both simplicity and looks. The span of the Roman Arch is particularly suited for climbing ornamentals, vegetables, fruit trees and is often used as a rose arch. 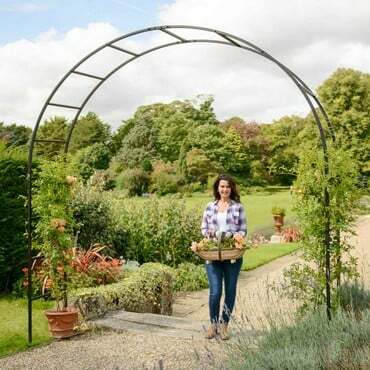 With the top quality materials used in this steel garden arch, you can be sure it will be around for years! 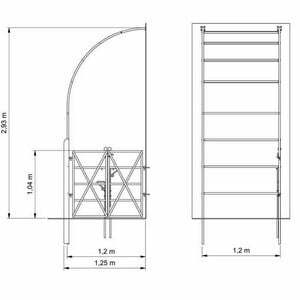 The Estate Fence Gate features a traditional 'X' Brace design and can be used as a stand alone feature in the garden or can be linked to our popular Estate Fencing or in this case, makes an attractive and practical feature under an arch. 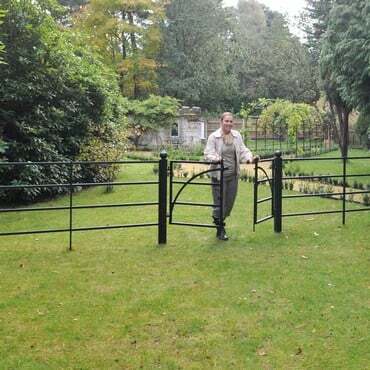 The 'X' Brace gate is made to last, using fully galvanised steel, powder coated black for a long lasting, maintenance free finish and comes complete with a 10 year guarantee. 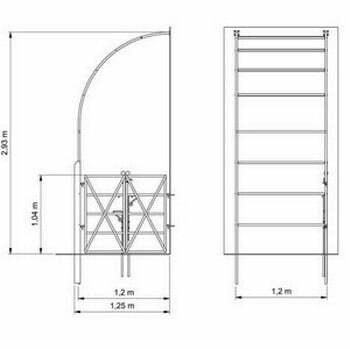 The 2 door gate has an 'X' brace which runs from corner to corner and features 2 doors, a latch, drop bars and drop socket tubes. The stout 75mm square gate posts come complete with a decorative ball finial for a sophisticated finish and the width inside the gate posts is 1.2m. 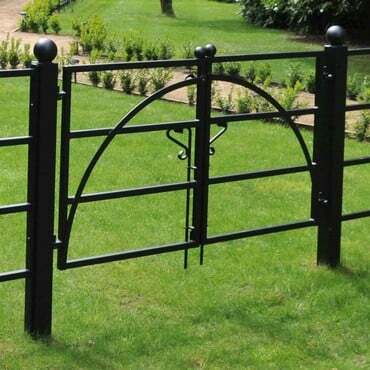 Made from galvanised steel, black powder coated for maintenance free long life. Gate posts use 75mm square section steel - topped with a decorative ball finial. 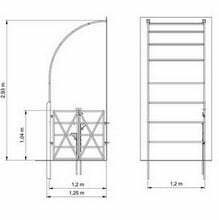 Arc Design Gate is also available.